The LILO Private Residence is a brand new luxurious residential with private surroundings. 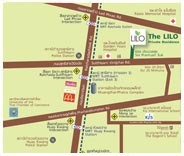 We are located on Sutthisan- Winitchai Road ,Bangkok. Our location is only a few minutes walk to MRT Sutthisan, with direct road connections to both Ratchadapisek road and Ladprao road. Excellent value of few minutes walking to MRT "Sutthisan" Station which makes it convenient to the residents for visit many interesting places, just in touching distance such as Fortune Town IT Mall, Esplanade Shopping & Entertainment Complex, BIG C Extra Ratchada, Central Plaza Rama 9, and Jatujak Weekend Market., etc. At The LILO Private Residence, our property consists of two residential buildings of 8 floors each and one clubhouse, a total of 109 rooms. We are created to provide luxury and comfort in a home-style atmosphere, available in flexible configurations of studios, one, two and three bedrooms and all rooms are fully furnished. The size of the residences varies from 30 sq.m. to 120 sq.m., with some featuring a spacious private balcony and overlooking the pool. All rooms are furnished with high quality teakwood furniture and each one includes an individually controlled air – conditioning, private bathroom with walk-in shower and water heater, full-size refrigerator, microwave oven, and 32”LCD TV & 80 Channels cable TV.